Holiday Inn Benoa is one of two Holiday Inn Family resorts in Bali. 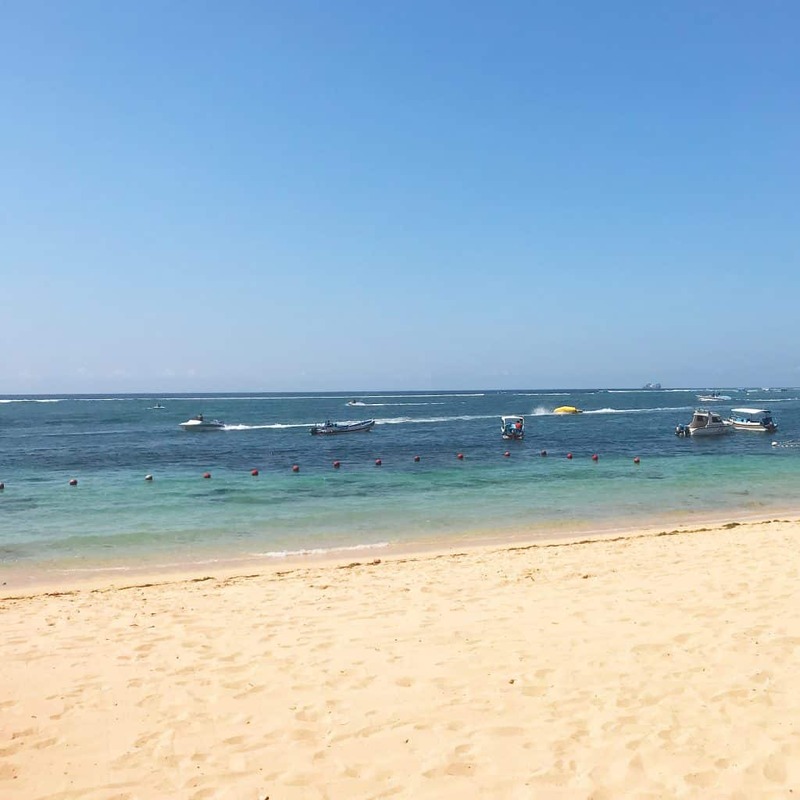 Located on a strip of immaculately clean pale gold sand on the beachfront, just 20 minutes from the airport, it’s a go-to for families wanting a complete fun and relaxation experience on their Bali family holiday. 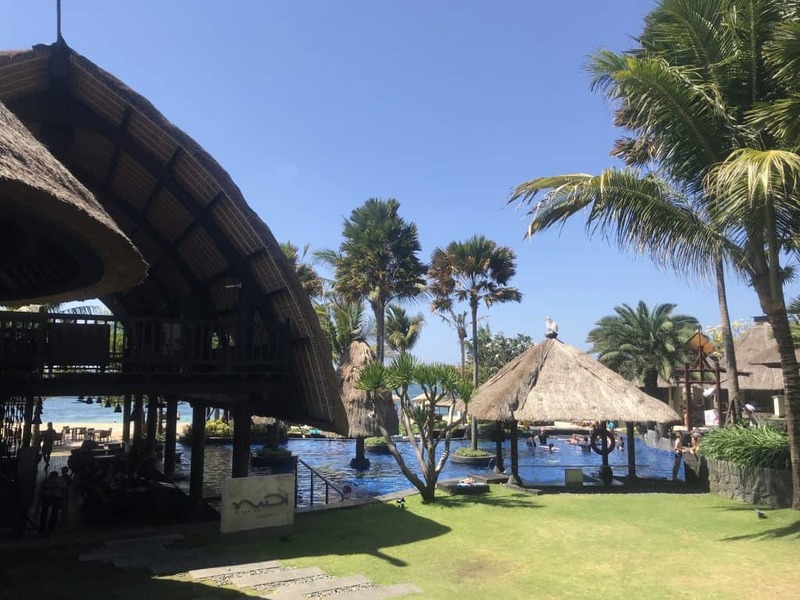 We stayed for two nights and three days at the resort and have compiled this thorough Holiday Inn Benoa Bali review about its room, food, service and facilities to help you decide if Holiday Inn Benoa is the right place for your Bali family holiday. 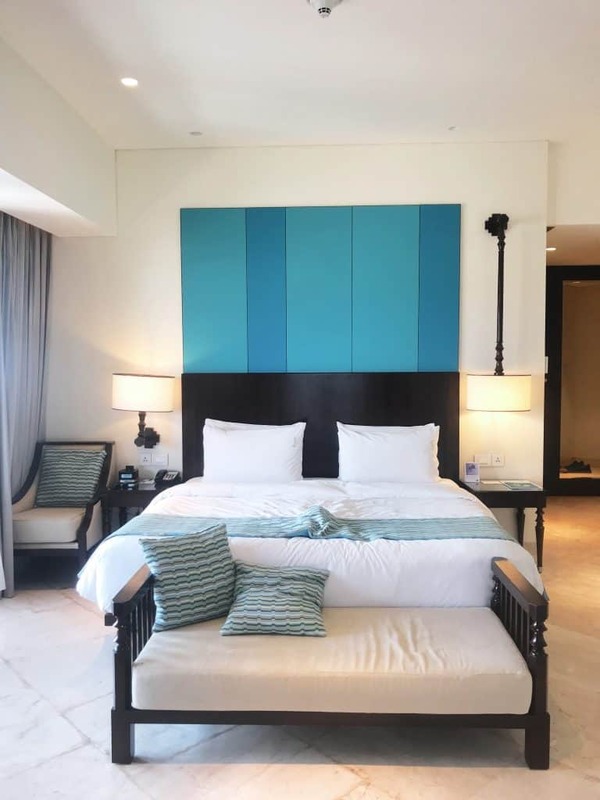 Holiday Inn Benoa is around a 20 minute drive from Bali airport, and has a premium beachfront location. The hotel’s outdoor pool stretches right up to the sand, where there are plenty of sun loungers and water sports opportunities. As soon as we stepped into the hotel we loved the huge ceilings and light and airy space in the lobby. There’s a huge sofa and indoor ponds and swimming pool which gives the hotel the typical Balinese outdoors-indoors feel and opens up the resort. 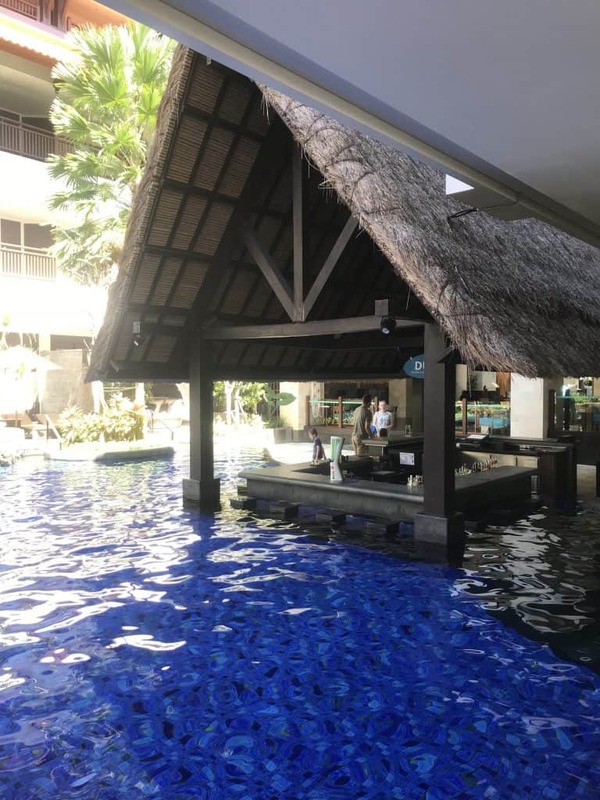 The swim-up bar near the lobby sits in a pool that stretches outside and down to the the beach, with a kids’ pool and beach bar with thatched food as well as a traditional beach stand with sarongs, floats etc. There is also lots of greenery and foliage which adds to the tropical and exotic atmosphere, and all in all we thought the hotel was gorgeous. “Let’s take a nice family picture, kids.” Thanks guys. As soon as our taxi pulled up in the drive, a smiling porter stepped down to open our doors, welcome us and take our suitcase. There was no queue for check in and two ladies warmly welcomed us and found our room details, while another gentleman brought sweet iced tea for Patrick and I and strawberry milk for the kids- this was a lovely touch and the kids sat on the large lobby sofa to enjoy their drinks while we finished checking in. 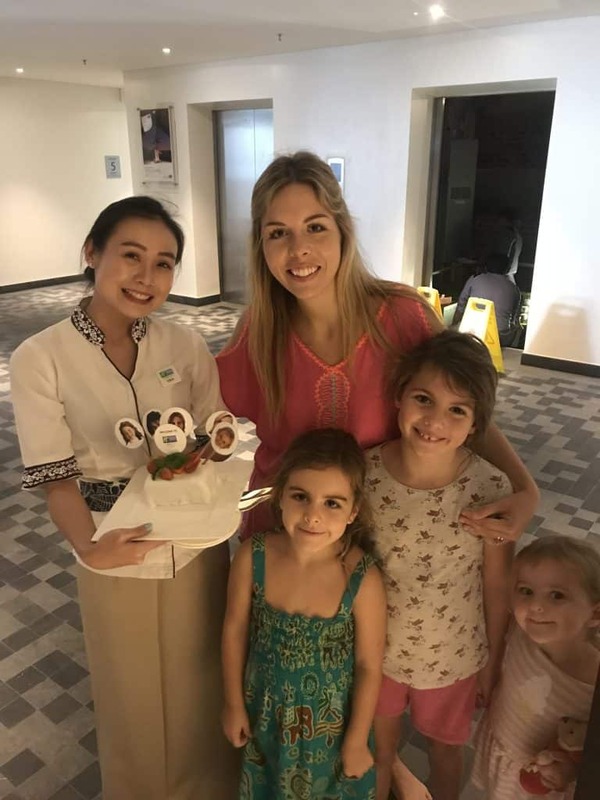 This is just the kind of touch that makes a big difference to parents traveling with children. When we were ready to go to our room a porter kindly brought our bag up and gave us a quick room tour and explanation of the facilities and how to contact room service. 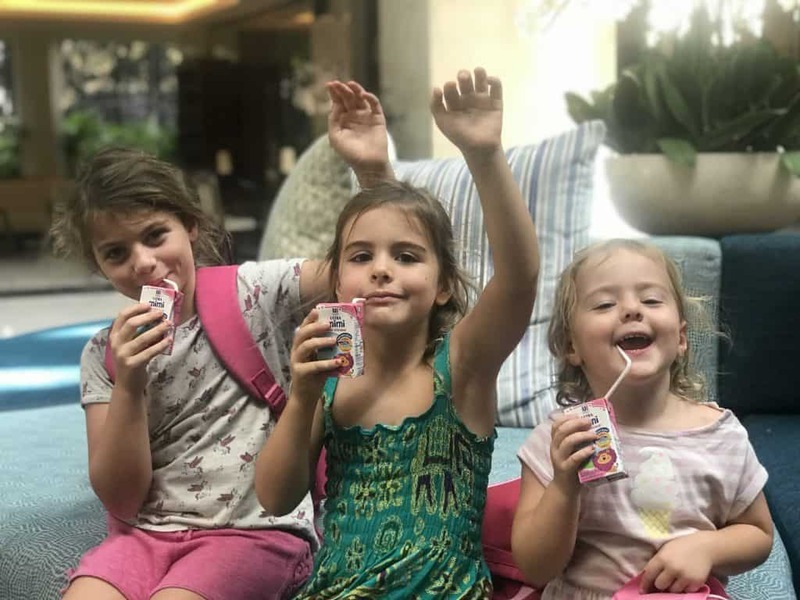 Strawberry milk on holiday = life made. 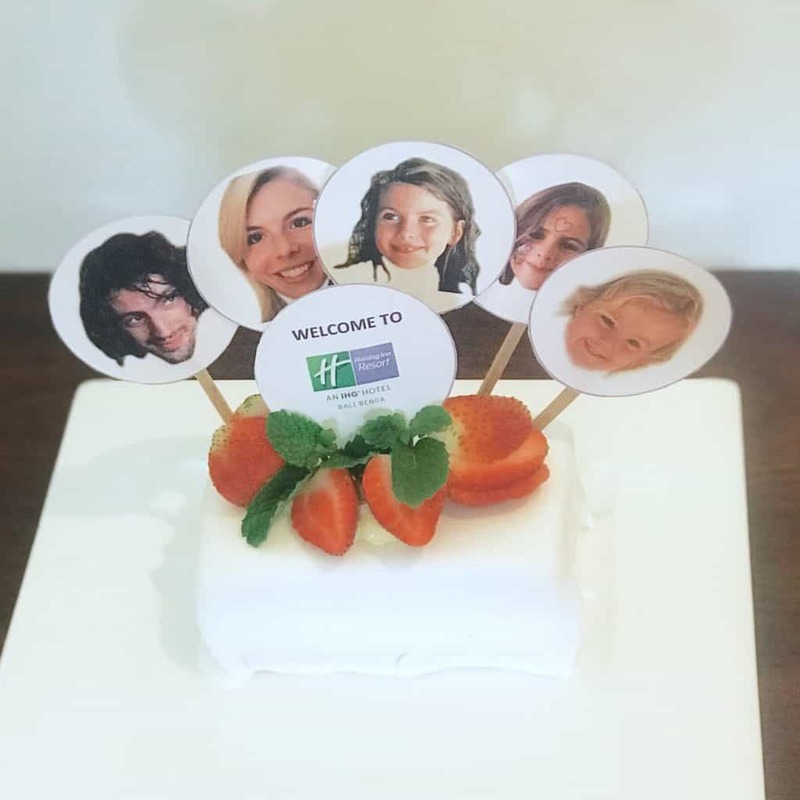 Ten minutes after we had started relaxing in our room we had knock at the door and a lovely lady appeared with a welcome cake, complete with our faces on. We all cracked up laughing, it was such a sweet gesture and the kids absolutely loved it. Holiday Inn also does something pretty cool with fruit baskets- every guest gets a welcome card explaining that they can dial 0 at any time for their fruit basket to be brought to their room, or opt instead for a donation to a local charity. I thought this was an excellent idea as often fruit goes to waste (although not in our family!) and this still gives guests the option of having a lovely tropical fruit basket if they wish. The lovely Eka from Guest Experience with our amazing cake! We were delicious, in case you’re wondering. Interesting fact: Holiday Inn Benoa has no fourth floor- so they’re numbered 1, 2, 3 and 5! This is because in Chinese culture the number 4 is bad luck, so they just skipped the whole thing and missed it out. So we were in room 535 but *whispers* it was really the fourth floor. Holiday Inn has several categories of room to choose from, and we stayed in the Tanjung Adventure Suite. 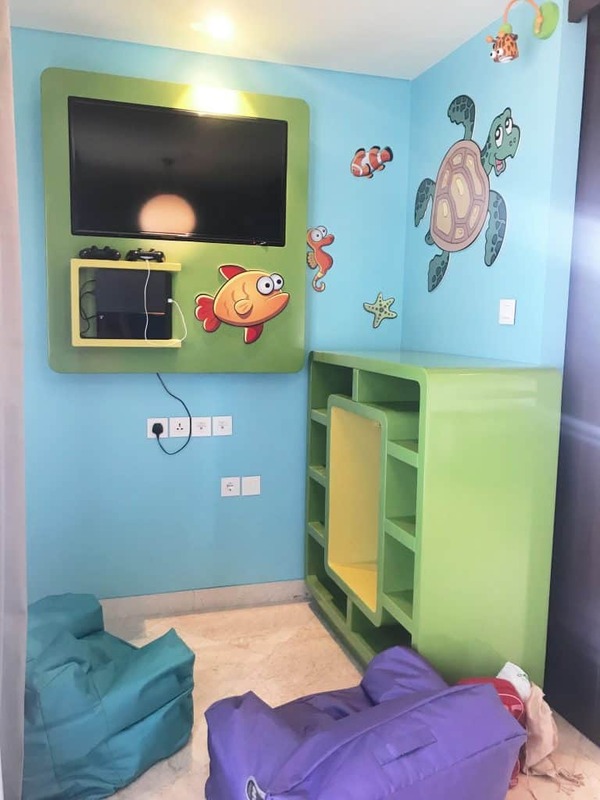 This is a fantastic option for families, with an underwater-themed kids’ room complete with bunk beds and a PlayStation 4 (we borrowed games from reception) and an interconnecting room with a king size bed for Patrick and I. There was a selection of pillows from soft to firm on each bed, and you can request your preferred pillow type if you would like to change. A mini fridge and tea and coffee making station including both a kettle and an espresso machine are also in the room, which Patrick appreciated very much! A good supply of different teas plus sugar, creamer and sweetener as well as foil packs of espresso were supplied and refilled daily. Our bedroom had a television and desk- handy for chilling or working in the evenings! The bathroom was something else. 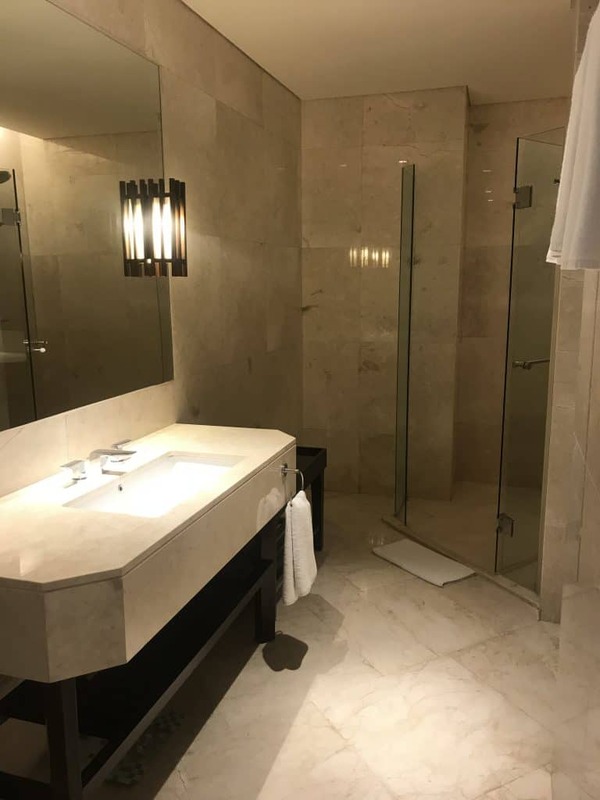 The shower could easily fit all of us in (although we had no intention of testing this); we had a large sink area and plenty of fluffy white towels and toiletries which were refilled every day. It was far bigger than we expected for a family room which added another touch of luxury to the stay! Our rooms were serviced twice a day, once a thorough clean and replenishment of amenities and once for a turndown service. We loved the elephant towel art on our bed! Of course as soon as we had settled in (and the kids had argued about where to sleep/ fallen off the bunk bed twice) we headed straight to the kids club. It’s great- it has a ball pit and slide, trampoline, mini cinema, computers, dress up area, colouring, books, games consoles and a program of extra activities twice a day such as baking, t-shirt decoration and hair braiding (these were 100k per child, around £5). 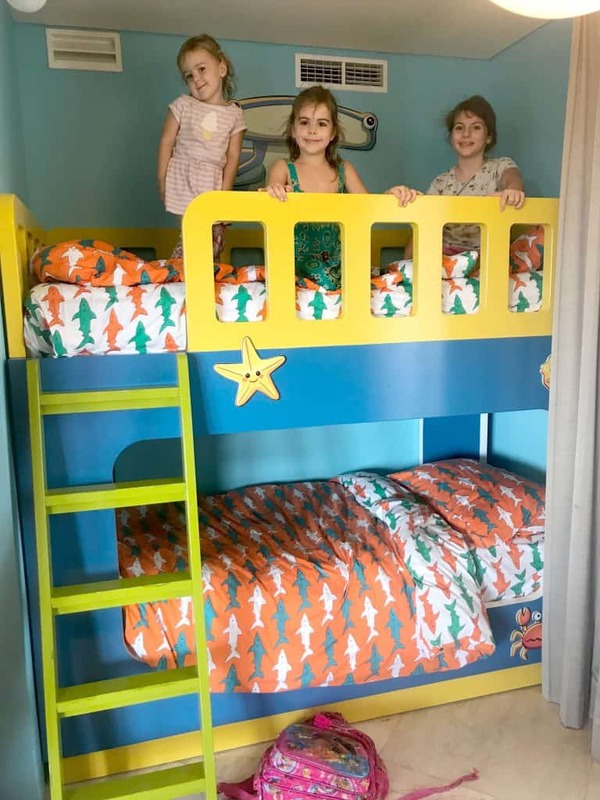 Kids aged 4 and up can stay in the care of the staff, and those under 4 are welcome to go in for as long as they like with a parent or guardian. When you leave your kids you either keep your mobile phone on you so the staff can get in touch, or they give you a phone to borrow which we thought was a great idea. 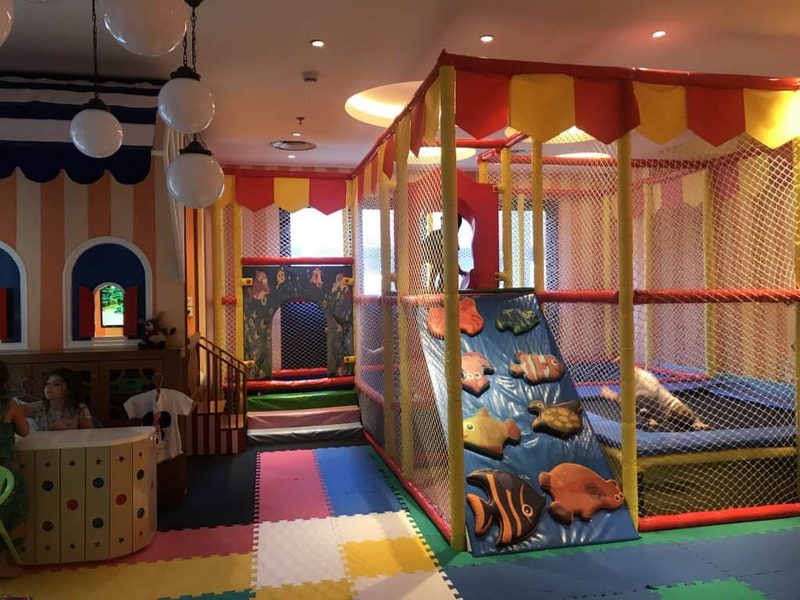 I stayed in for a long time as Elfie is 3 and the staff were consistently good with the kids, trying hard to help kids who didn’t speak English and being gently firm with children trying to leave without their parents. The kids club is open 9am-9pm, with a movie night each evening and kids can stay in for as long as they like- bliss! Babysitting can also be arranged so that parents can enjoy a romantic meal or spa treatment together. The most important bit of any holiday- the food! NB: At each meal staff will bring your family colouring sheets, oil pastels (I know right) and conversation cards to entertain the kids, which I thought was a lovely gesture. 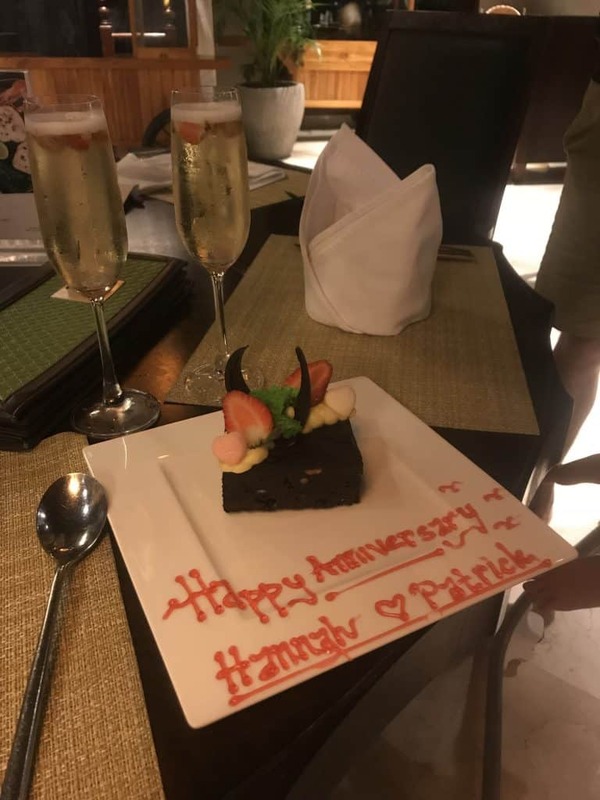 They are also very good at celebrating occasions and we enjoyed champagne and a beautiful chocolate cake on our wedding anniversary. We forgot our anniversary- the staff didn’t!! 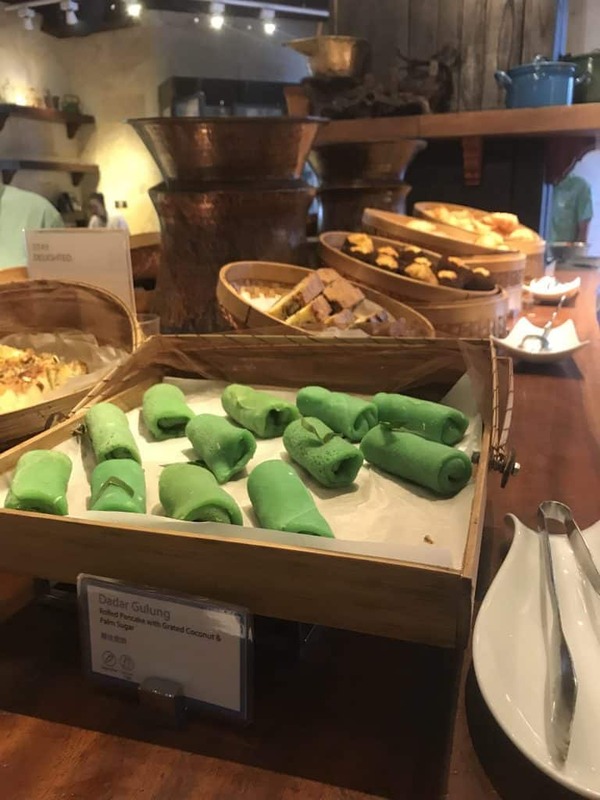 Breakfast: Holiday Inn Benoa has a huge breakfast buffet that starts at 6.30am and goes on until 10.30am. There is a helpful card in each bedroom explaining that 6.30-8 is the quietest time, then 8-9, and 9-10.30 is when most people dine- we checked out each time period (Eira was up early and went with Patrick, Elfie and Esmae came with me for the latest session and the second morning we did the middle) and it was never too busy, and everything was kept stocked and fresh. Unlike many buffet breakfasts, quality coffee was served from a barista machine and there was a great selection of tea. Indonesian sweet pancakes with shredded coconut- yum! Lunch: We arrived at around 1pm on the first day and had dinner booked for 6.30pm. The kids were hungry so we ordered a couple of dishes from the room service menu- a corn soup and fish ‘n’ chips with a mini Greek salad. Our welcome cake and fruit basket were delicious and great for snacking on while the kids waited for their food. The dishes were fresh and good sized portions and didn’t have too much oil or salt, but came with plenty of condiments and the girls polished it off in no time. On the third day we ordered lunch from the beach bar and again it was good quality with ample portion sizes. Then, dinner- we were thoroughly spoiled with a private candlelit dinner on the top level of the bamboo restaurant, complete with rose petals, lanterns and a view of the ocean. We were able to order from the new vegetarian menu before it launches next month (August 2018) and it was great. Patrick had mushroom soup with garlic bread for starters while I enjoyed a huge papaya salad- large enough that I wasn’t too hungry for my equally delicious vegetable and chickpea curry with steamed rice. Patrick’s main course is what we’d both order next time- pasta with a creamy pesto, and we finished off with a chocolate and fruit pizza (me) and a banana split (him). The kids all had fish, baked potato wedges and salad followed by ice cream and fruit. 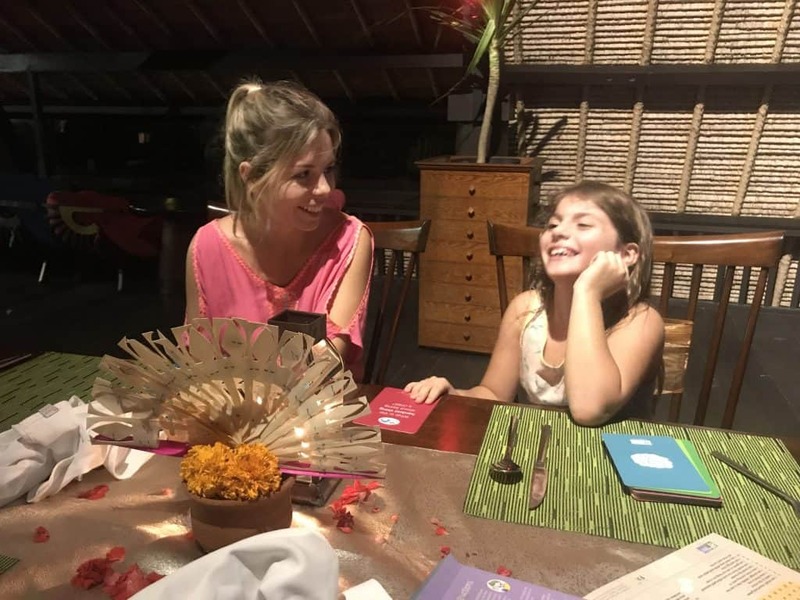 Both the regular and vegetarian menus are extensive and have lots of variety and options from pizza and pasta to traditional Indonesian food. “Let’s have a nice photo at dinner.” Thanks, Eira. We LOVED the Holiday Inn conversation cards as dinner entertainment! Exactly what holiday memories are made of. 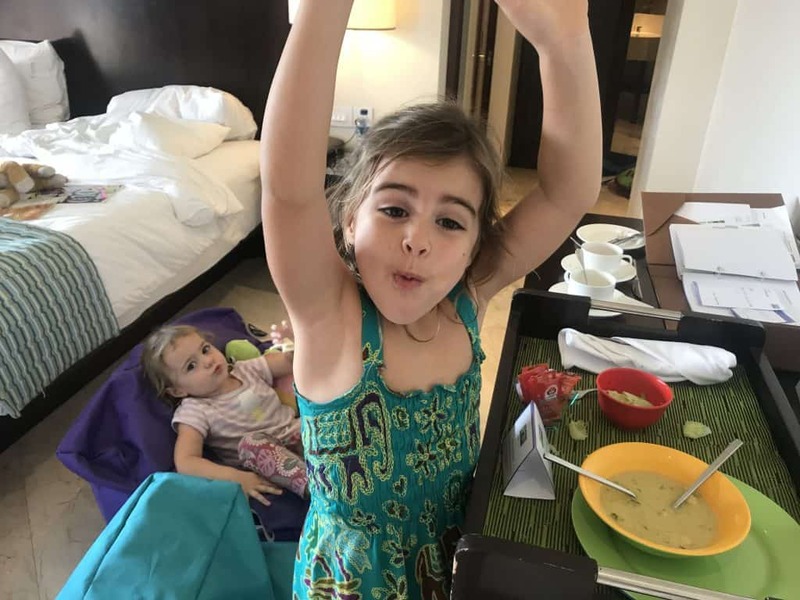 Something we really liked about the food set-up at Holiday Inn was that kids eat free (main, dessert and drink) with every adult main, which saves a lot of money over the course of a holiday. 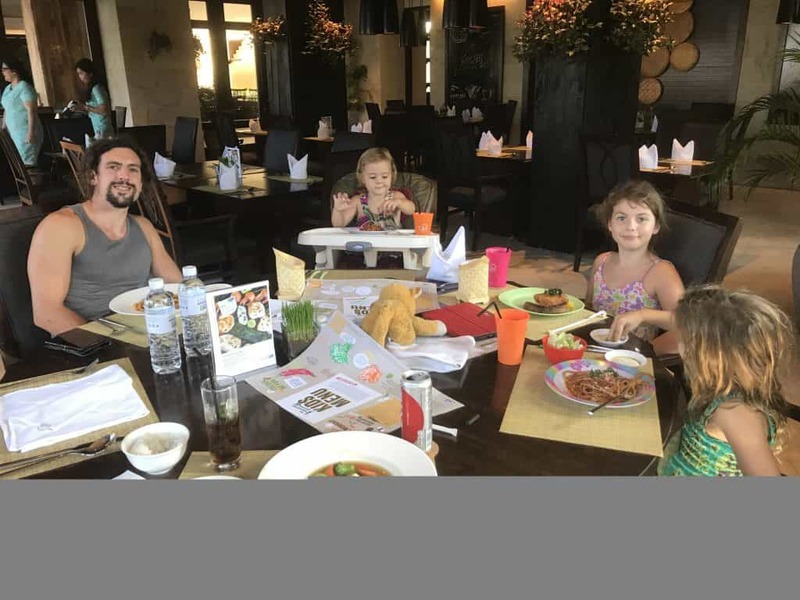 It meant that Patrick and I could order a main each, the kids had their food and it cost just £10 for a whole family dinner! 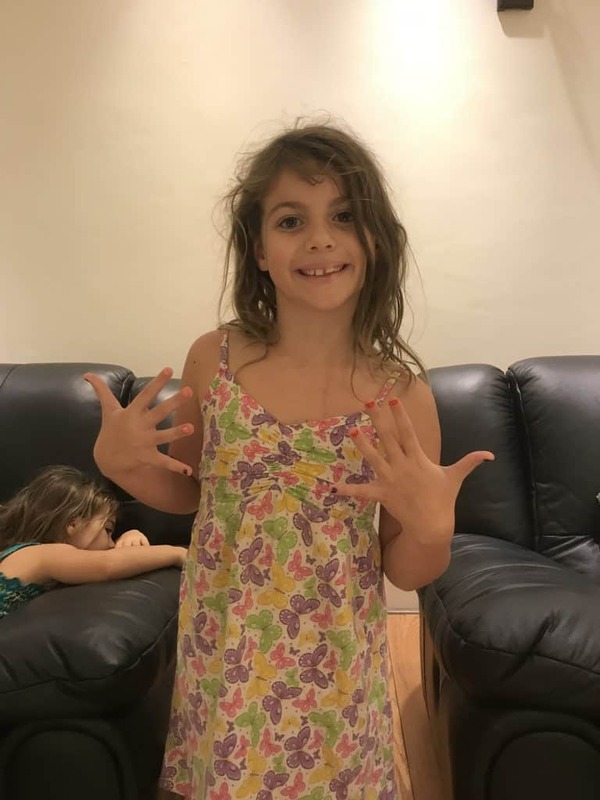 Our girls were booked in for a very special spa treatment- “My First Manicure & Pedicure.” They absolutely loved it- they were given a cold towel and juice on arrival, picked as many colours as they liked for their nail polish and then had a whole hour of pampering in lovely soft chairs. Even our 3 year old managed the whole hour, with just a bit of wriggling at the end! 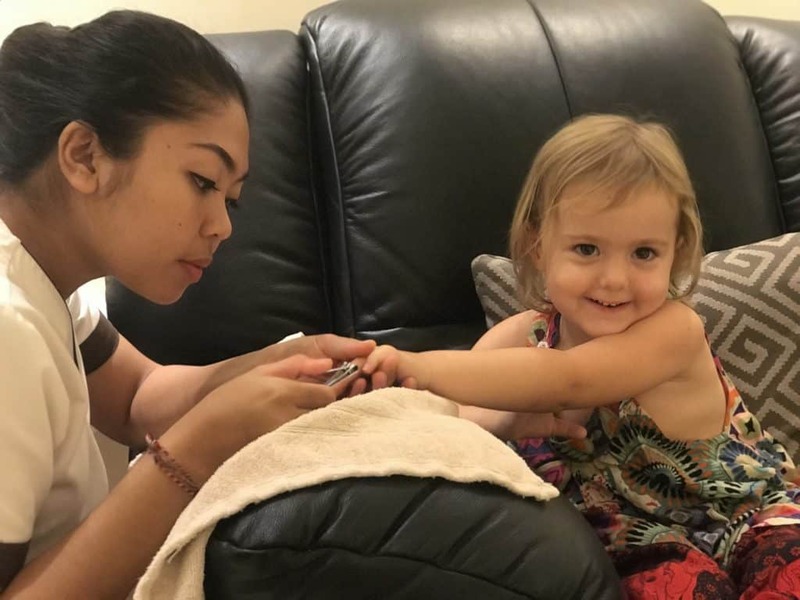 If you have kids you can get a treatment at the same time; it’s a lovely way to relax and bond together. Try the herbal ginger tea while you’re in the spa- it’s out of this world! 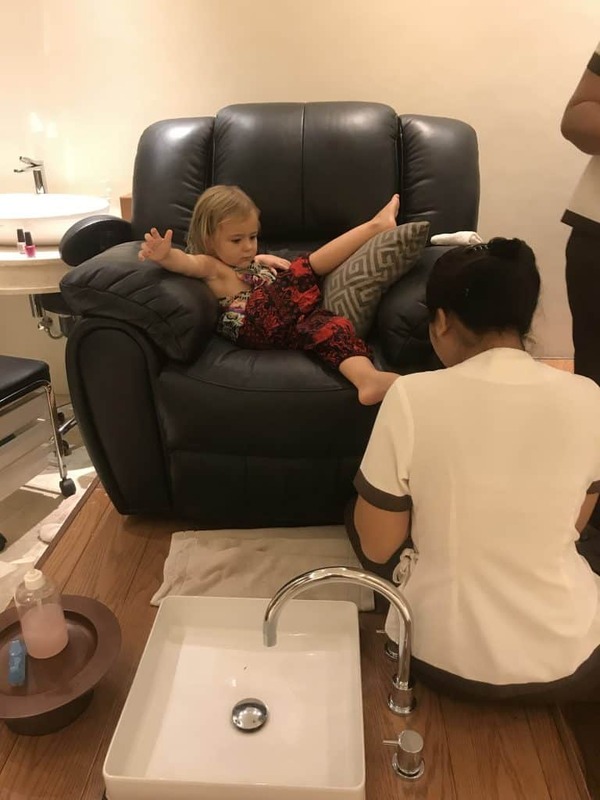 How you get a pedicure when you are 3. One very happy little girl! (Plus one VERY tired little-er girl). Something I was very happy to see was that all of the toiletries at Holiday Inn were paraben free and not tested on animals, and that the containers and wrappers were all biodegradable. There were signs in the bathroom about water and electricity conservation, and the new vegetarian and vegan menu launching next month should also go some way to contributing to a more eco-friendly guest experience. The staff were all lovely, very warm, engaging and helpful. They always had smiles and high-fives for the kids and pre-empted when we needed an extra set of cutlery. They could see we had our hands full with the three at the buffet and helpfully carried the kids’ drinks. The staff knew all our names and were very friendly, greeting us throughout the day, making conversation with the kids and asking how our stay was and if we needed anything. 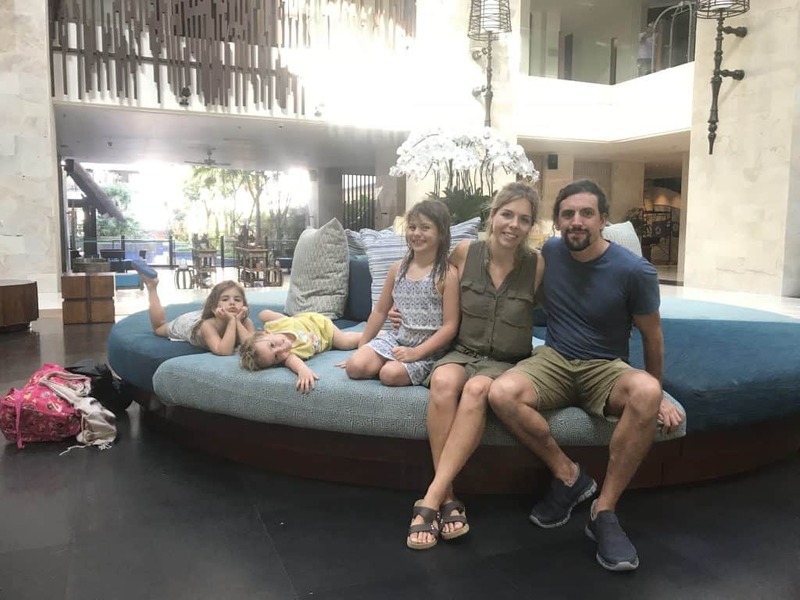 We were very impressed with Holiday Inn Benoa Bali as a family resort- between the location, the rooms, the staff and the facilities we would highly recommend it for a Bali family holiday! To book your own family break at Holiday Inn Benoa Bali, check out the latest rates here! Disclaimer: Our stay was complimentary is return for a review of the resort. 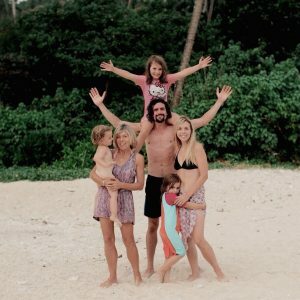 Our stay was not conditional of a good review and we were not asked or paid to say anything positive about the resort. In essence this is NOT an advert, it is an accurate account of our two-night experience and all opinions and events are 100% honest.